In the week of 5th November I attended JT Foxx’s Mega Success event in Anaheim, Los Angeles with 2,500 people from all around the world, eager to learn, keen to grow, ready to design their life for the results they want to see. Because let me remind you, the life that you live, it’s your life and everything you do or you don’t it’s your decision. And as I’m learning and learning, growing every day, I have understood, deciding eliminates fear. When we decide, we can move forward; when we don’t decide, we get stuck, we overthink, we might fear the next step because of our overactive mind. Then we often get frustrated over various things, having overthought a situation, having been too fearful of the next step, yet then we regret not to have done something. We always regret the things we haven’t done, so think twice next time. Do you say yes or no to an opportunity? Do you decide or let fear win? I keep taking action, I keep making decisions every single day and you should, too. I don’t talk about all the tiny decisions we have to take every day, no I mean the decisions that could be life-changing for you, the decisions that can get you started on living the life you truly want, the decision FOR YOU. It is so worth it, trust me. After all, my actions and my decisions led me to the absolutely amazing opportunity to meet Brooke Shields (actress, model, entrepreneur) in Los Angeles. Not only did I meet her, but also I was up on stage in front of 2,500 successful, international entrepreneurs to have a fantastic conversation with her about success when it comes to health and wellbeing. After my interview with this beautiful woman inside out, I recorded a video for you because I wanted you to feel the energy that I got from that interview, from that moment up on stage, a pure state of happiness. Here’s the link to my video recorded live in LA straight after the interview with Brooke Shields. When I was a child, I always wanted to become an actress, moderator, travel reporter or a dancer; all things active and agile, travelling, exploring. I knew I wanted to be free like a bird, I also already knew I wanted to do my own thing, but most importantly I wanted to be happy. What I find most interesting is that all of my childhood dreams have one thing in common and that is serving and helping others. The beautiful thing is – although I might not be an actress or reporter – this is exactly what I do as Life & Business Strategist. I have worked on myself to become a better, mentally healthier and consequently happier person. And now I get to help people connecting with themselves, revealing their true self and designing the life that they truly want to live. And this makes me happy from within and I know it will make you happy, too, when you are ready to take action and walk that path of happiness. Are you ready to work on your body, mind and soul? Are you ready to actively design your life? Are you ready to go after the results you deserve? 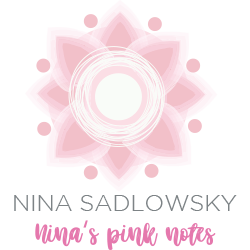 PS: Ensure you connect with me on Instagram & Facebook on ‘ninaspinknotes’. And you can watch all my videos from LA on YouTube. Enjoy! Previous PostArise to success Next PostMove your body into flow state!